Tucked away in the north of Italy along the Ligurian coastline, Cinque Terre sightseeing includes seaside towns and hiking among olive groves and hilly vistas. Natural beauty is the Cinque Terre sightseeing highlight. If your Italy vacation includes northern Italy and touring the Cinque Terre you’ll enjoy the slow lifestyle, beach, food, natural beauty, and charm of the buildings and homes built right into the crevices of the hills. You won’t find museums or made in Italy fashion boutiques here. Just plan to enjoy the moment during your Cinque Terre vacation itinerary. Peering down on the harbor and lights at night is not to be missed, and hiking the hills during sunrise down to the beach will definitely be a vision you’ll remember years later. And for fabulous views of each village be sure your Cinque Terre sightseeing itinerary includes a trip by the ferry boat among the the five Cinque Terre villages. 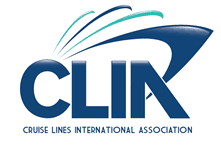 Click here for more information about tours of northern Italy and Cinque Terre vacations. The trails between the Cinque Terre villages range in difficulty and length. The paths are carved into the rock on the side of the hills. The trails tend to get longer, steeper and harder the farther north you go. To walk the entire Cinque Terre from Monterosso in the north to Riomaggiore at the southern end takes about 4 1/2 hours. For those who don’t like to hike, or maybe prefer to hike a little, the rail travels between the towns. We also love to travel between the villages by the Cinque Terre ferry boat. The view by boat from the sea back to the land is beautiful. As you may see in map below the Cinque Terre ferry travels as far north as Portofino and as far south as Viareggio on Tuscany’s coast. The ferry from Levanto to Portovenere is perfect to travel among the Cinque Terre villages. Map of Italy’s coast from north (L) Portofino to Tuscany’s coast south (R) Viareggio with Cinque Terre in center. Weather impacts the trails. 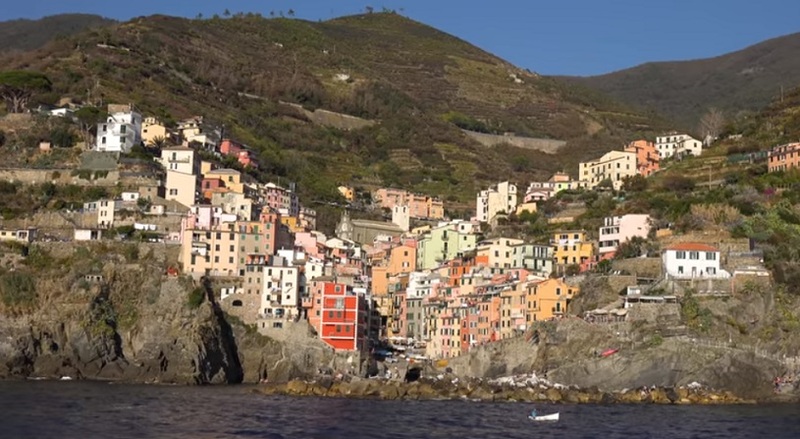 We suggest you check the Cinque Terre National Park website before embarking on any hike. You may also visit the official tourist office in Monterosso. As you travel the hiking path, you’ll find a number of wine bars overlooking the harbor where you may sip the wines made right nearby. Restaurants abound as well. Sometimes, in the summer, this place gets pretty popular, so if you need some alone time, stroll over to the Gulf of Poets around Portovenere. The hike from Monterosso to Vernazza takes 1.5 hours. It is the hardest trail because there are several steep ascents and descents. (on the portion outside Monterosso, you’ll pass beneath funicular-like cars that transport grapes down the steep hillsides). If you take a moment to depart from the famous hiking corridor onto the road between here and Vernazza, you will be following close to an old pilgrimage path. The Madonna di Soviore offers one stopping point to immerse yourself in this important part of Italian history, the history of the church. As with many religious places around the world, you will be inspired by the amazing view from the Madonna di Soviore, too. Along the way look for Il Gigante, a wonderful sculpture of the male form cut directly into a cliff’s edge. The leg from Vernazza to Corniglia is also demanding and takes another 1 1/2 hours, plunging into some dense forests and involving some lengthy ascents, but is probably the prettiest and most rewarding stretch. When you make your way along Cinque Terre, you’ll notice a similarity in architecture of the homes. Some of them are almost like towers or castles. Like many parts of Europe, narrow streets pack together and cover different levels of town. Closer to the water’s edge you can check out the remains of battlements protecting from naval invasions, such as the Castle of the Doria. Part of the path between Corniglia and Manarola, about 45 minutes apart, follows a level grade above a long stretch of beach, tempting you to break stride and take a dip. Once in Manarola, you may encounter one of the lovely vineyards, replete with fences covered in greenery and brightly colored doors draped with grape plant tendrils hanging down. Some may or may not be open to the public, so your tour guide can make sure that you have a chance to see a great Italian vineyard. The continued integration of religion into life here in Italy is quite literally built into the fabric of the land of Manarola. Your tour guide can make sure you see the nativity scene constructed on the side of a hill and explain the story behind its construction. From Manarola to Riomaggiore, it’s easy going for about half an hour along a partially paved path known as the Via dell’Amore, so named for its romantic vistas (great to do at sunset).As you continue your trek within the Cinque Terre, another point of interest is how the residents ‘moor’ their fishing boats. Some areas, covered with the rock that makes this area so transcendent with beauty, make for not-so-easy boat storage. At night, residents use cranes to lift their boats into parking garages.